Armchair fan Matthew Booth headed back to the pub for the Netherlands-Brazil quarterfinal. Editor’s note: CNN Hong Kong Operations Supervisor Matthew Booth will attempt to watch every match of the World Cup on television in the wee small hours of the night. Can he do it without being fired/divorced/committed to an asylum? Follow his updates here, as he becomes more and more incoherent from extreme sleep deprivation. 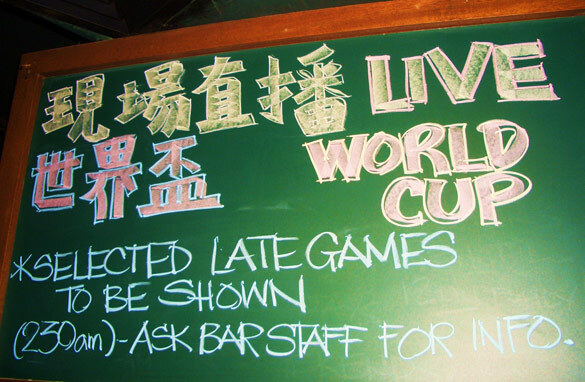 Hong Kong, China (CNN) - As the game schedule has become a bit more sensible, I prized myself away from the loving embrace of my couch and went to the pub for Netherlands vs. Brazil. My wife and I arrived five minutes before kick-off, and when we got through the doors I wondered if we had just bumped into some kind of YouTube flash mob. The place made a sardine tin look like a four-bedroom flat with a harbor view. It was also roasting hot, so squeezing past people to get to the bar was a little bit unpleasant, if well lubricated. We found two square feet to plant ourselves and were only able to offer our friends on the other side of the bar a nod of acknowledgment through the crowd and a slight grimace that said: "Sorry we didn’t show up earlier, but my nap spiraled out of control to become a fully-fledged sleep." My Dad showed up to join us and took up the remaining square foot in the serving area at the bar. He repeatedly had to conduct ballroom dancing spins every time a server needed to pick up something from the kitchen. It became obvious that most of the Chinese population of the bar was supporting Brazil when Robinho put them ahead, but there was also a very angry group of miscellaneous Euros who loudly accused the South Americans of cheating whenever they did anything. My preferred team was plain to see as I was wearing my rather convincing, but totally fake, Holland shirt that I had bought that day at a local market. It was 10 dollars, 12 if you wanted a pair of shorts with it, but it looked the part. I rather sadly noted that there was an enormous pile of unloved Rooney shirts that would shortly find their way to a Chinese landfill. Given the counterfeit nature of my shirt, there was an outside chance of it staining my entire body luminous orange, and I was a bit worried that if the colours did run I would look a bit like a podgy highlighter pen on my post-World Cup beach holiday. Thankfully, the clothing dye held, and the "podgy" part is now the only cause for concern. Back in the pub, at the halftime break we were able to move around again as the smokers grudgingly surrendered their viewing positions to feed their habit. The Euros were still grumbling about "Joga Bonito" (Portuguese for "beautiful game") - and enormously tall Dutch men in the bar were trying to maneuvre between me and the television. The second half kicked off, and Veronica had to go home to watch, as the five friends she’d invited were unable to crowbar themselves inside. I looked at her with some envy, as she returned to our air-conditioned, high-definition living room to sit in great comfort on our nice, soft, welcoming couch. The space she left was filled by my old friend Burley, who is a bit taller than me and - due to the calls of "Down in front!" - had to watch portions of the game with knees bent like he was laying an egg. The game exploded into life with two quick Dutch goals, and the grumbling Euros became suddenly enlivened, and the drinking became somewhat frenzied. A desperate waiter asked a harassed barmaid who was pouring four pints at a time: "Are we still serving cocktails?" She shot him a look that could have caused an ice cube to burst into flames, and he rapidly retreated. The last 10 minutes of the game seemed to take hours, with one half of the pub complaining about Robben’s theatrics and the other half so panic-stricken they were barely able to complain at all. When the final whistle eventually sounded, half the pub exploded with joy, and everyone seemed to be either celebrating or commiserating with a globally-available Dutch lager. I smugly pocketed the meager winnings from my friendly wager with my group of friends. At halftime I had bet on the Dutch winning 2-1. I wish I could put this down to my Jedi footballing intuition, but the truth is, 2-1 to Holland was the only sensible score that hadn’t already been taken. This was the best match I’ve watched in the pub from this World Cup. The tension in the bar crackled and fizzed, and not just between the serving staff. It was great, but all good things come to an end. The remaining games all start at 2:30 a.m., so it’s back to the sofa for me. I just hope that it’ll take me back. Pub vs. Couch? Let’s call it a draw. There are many other people who alos watch the whole world cup. And this isnt even too interesting! But I gotta say that it must be tought to watch all the games in east Asia. Horrible timings there! But here in holland/belgium its fine for me! Oh, and IM GOING TO THE WORLD CUP FINALS!!!!!!!!!! V good. Now, will it be Germany over Spain?